Based on Doctor Who, the longest-running sci-fi TV series in the world. Features series-specific artwork in the image of a TARDIS! It's a terrific collectible that makes a great gift for Doctor Who fans! Entertainment Earth Comic-Con Debut! Dine with the Doctor! Bif Bang Pow! 's wonderful line based on Doctor Who, the longest-running sci-fi TV series in the world, continues with this fantastic Doctor Who TARDIS Tin Tote! 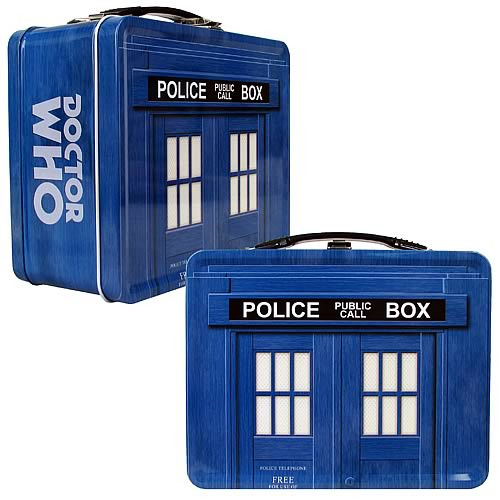 Featuring series-specific artwork, the metal lunch box measures 8 5/8-inches wide x 6 3/4-inches tall x 4-inches deep and looks like a TARDIS. It's a terrific collectible that makes a great gift for any Doctor Who admirer!